Most people assume that brushing their teeth gets rid of all the oral hygiene issues for them. However, they are not aware of the fact that it is not an all-in-one solution for your oral health. There are many other things that you should consider using apart from a toothpaste. One of the most important among the rest is mouthwash. To know more about mouthwash and its benefits, continue reading this article. This one is the most common. Mouthwash gives you a good breath that not even a toothpaste can give. However, it does not last for a long period of time. It kills all the bacteria that is associated with bad breath and leaves a very sweet yet cooling fresh breathe. It good part about them is that you can get a variety of flavors. So, get the flavor which you like the most. It is very common nowadays that most of the people use mouthwash only after brushing their teeth. They do it to get a fresher breath. However, there is something that they are not aware of. It also clears all the loose particles that formed in your mouth when you wake up. Try using your mouthwash before brushing and get a better brushing and flossing experience. 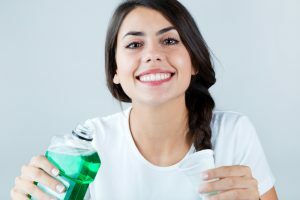 There are various mouthwashes on the market that can help in preventing the growth of plaque on your gums. It can also grow in the middle of the teeth and on the surface of the teeth. While it surely prevents the growth of plaque, it cannot end the plaque that already exists. So make sure that you brush your teeth regularly because together, they can be a cure to many of the oral problems. Yes, it can also prevent the cavities from growing. It is because it contains property of fluoride that prevents your teeth from cavities and it also makes your enamel stronger. Just a tip, make sure that you check the back label of the mouthwash that you are going to buy. It is because most of the mouthwashes don’t have fluoride in it. Canker sores are a kind of ulcer in the mouth. With the regular use of mouthwash in your routine, you can get rid of them within days. These are some of the benefits that you can enjoy if you start using a mouthwash. Using it with a toothpaste will enhance your dental health for sure. Make sure that you schedule a visit with Alla Agamov, DMD as we can recommend what is best for your mouth!